St. Helena, CA – Aikiko Moorman, an accomplished culinary professional with many successes, equated a career in the culinary industry to that of a professional athlete. 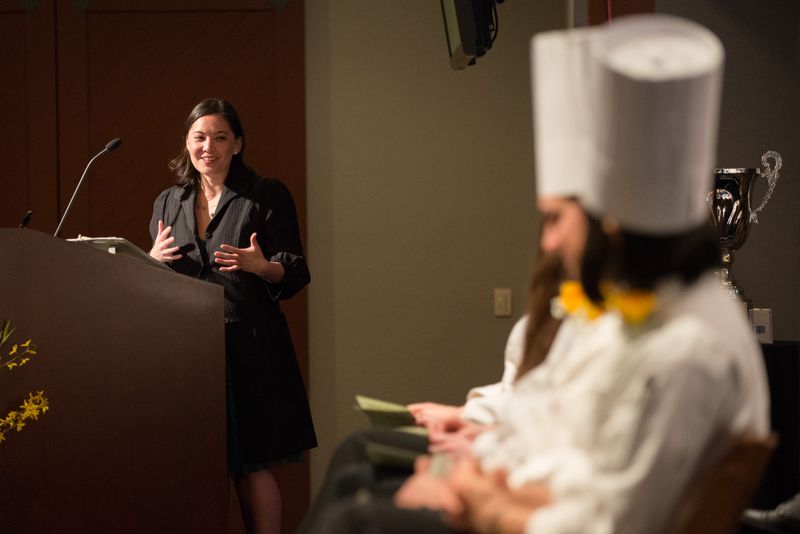 Moorman addressed 29 graduates from the Accelerated Culinary Arts Certificate Program (ACAP) at The Culinary Institute of America (CIA) at Greystone on Friday, March 21. "Being successful in this industry is as close as you can get to being a professional athlete," said Moorman. "The physicality, the practice of doing the same thing over and over again while having the personal goal of perfect execution every time, and injecting artistic style." Moorman has found success as a chef, restaurant consultant, food stylist, event planner, and entrepreneur. She has been a food stylist for celebrity chef Bobby Flay and many other Food Network stars, and on the set of the acclaimed HBO series Treme in New Orleans. Moorman has also appeared on Food(ography) with Mo Rocca, worked for Chef David Chang at Momofuku and Jean Anderson at Freemans, and served as chef de cuisine at Speck in Philadelphia.